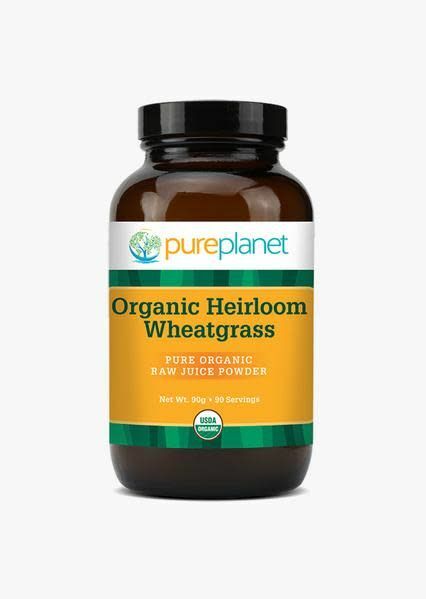 Ancient and organic seeds of Kamut and Alfalfa are grown in organic soil and processed at low temperatures to produce Pure Planet’s highly nutritious wheatgrass blend . Our seeds have never been crossbred or hybridized, ensuring a pure, non-GMO cereal grass . Unlike tray-grown varieties, our farm-grown and non-pasteurized grasses allow deep roots to absorb the broad range of nutrients and are a lightweight vegan protein. A convenient substitute to juicing that Does Not Contain fillers, sweeteners or additives of any kind and great for all ages. Suggested use for powder: Take ½ level tsp with 8 oz . of water 1-2 times daily . Add or mix in smoothie . For capsules, take 3 with water 1-2 times daily . For best results, take on an empty stomach . Ingredients: Organic Kamut® Khorasan Wheat Grass Juice Powder, Organic Alfalfa Leaf Juice Powder .